Blame game | Climate Etc. There are legitimate doubts about the scale of the impact, and about other offsetting factors that may reduce human-induced global warming. But what should be a wake-up call is science’s growing ability to highlight the blame for particular extreme events. For instance, a recent paper by Fraser C Lott and colleagues examined the increased probability that the 2011 East African drought in Somalia and Kenya can be attributed to human-induced climate change. Pardeep Pal and others investigated the impact of climate change on the £1.3bn insured losses from the flooding in the UK in 2000. Peter A Stott and others looked at the hot European summer of 2003, and its heatwave-related deaths. Richard Washington, the professor of climate science at Oxford, rightly highlights the importance of this scientific work for its ability to change the global political and legal game. The science also opens up the possibility that the victims of climate change could begin to take international legal action against the countries responsible, particularly the early industrialisers, such as Britain, Belgium and Germany, whose carbon continues to warm the planet a century after it was emitted. Legal action is not a substitute for politics, but it could highlight the evidence in an uncomfortable way. This year a group of small island states threatened by rising sea levels, led by Palau, came close to asking the International Court of Justice for an advisory opinion on the responsibility of historic emitters for global warming. The main reason they did not press ahead then was that the scientific case is strengthening by the month. A later case will be even stronger. The UN framework may not be ideal, precisely because it is dominated by the historic five powers, all of whom have their own interests. But the Hamburg-based International Tribunal for the Law of the Sea may be a forum that would hear the matter. It is not a defence that we did not know what we were doing, nor does a case have to target everyone who might have historic responsibility: countries are jointly and severally liable, which may help to deal with the problem that the United States is often not a signatory and hence denies international jurisdiction. Paradoxically, one of the strongest cards that the historic emitters can play is to highlight the international effort to tackle climate change. Legally, they can argue that the global process under way since 1992 through the Kyoto Protocol and the countless meetings of the “convention of the parties”, is itself a response to the need for action, and displaces the need for lawsuits. But that implies that the global political process must hold out – as it can and should – a real possibility of delivering change. If it fails, the historic emitters may want to consider some of the consequences, not least of which is the possibility that embarrassing legal cases will display the increasingly strong scientific evidence about who is to blame. The chickens are coming home to roost – whereby misguided attempts to attribute extreme events to AGW are providing fodder for future lawsuits against countries that industrialized early. One critic argued that, given the insufficient observational data and the coarse and mathematically far-from-perfect climate models used to generate attribution claims, they are unjustifiably speculative, basically unverifiable and better not made at all. Climate change and extreme weather: linked at last? The same climate models that failed to predict the 15+ year hiatus and and cannot resolve most extreme weather events simply cannot be used sensibly in analyses of attribution of extreme weather events. Further, as I have argued in previous posts, the whole problem of extreme event attribution is ill posed. As for the politics of all this, the linkage with emission mitigation policy is interesting – success or failure of mitigation policies may rev up or quash litigation related to extreme events. This entry was posted in Attribution, Policy. Bookmark the permalink. The inevitable response to this form of posturing would be for developed countries to remove all voluntary forms of aid that they contribute to developing countries. Developing countries can then make their appeal through the law courts and good luck to them. It will be argued that, as the claimants are using technologies directly created from the industrialisation that generated the CO2 and that those technologies could never have been developed without that industrialisation, they can either receive heavily discounted damages or stop using steel, iron, electronics, modern medicine etc. etc. Only the lawyers will get rich. Money will be diverted from vital budgets to pay them. Huhne is a fool. Huhne is also convicted liar. Found guilty of perjury (lying under oath) and sentenced to do time in a british jail. Listen to moralist waffle about “responsibility” for extreme climate from Huhne is like taking advice on ethics from Peter Gleick. These fools just don’t have neither the shame nor the good sense to know when to shut up and go away. They just imagine that if they come brazenly back and carry on as it nothing happened it will all get forgotten. The “wake up call” ex-minister Huhne is for you. No one gives a damn what you think nor believes a word you say. You had a position where you could have had influence and you blew it. You’re right Greg, Huhne is known throughout Britain as a convicted liar. Both he and his former wife were convicted of perjury and given prison terms. Only the discredited Guardian newspaper would allow this convict, who is fresh out of jail for lying on oath, to pollute the pages of their paper with more lies. Before he was convicted he held the position of Energy Secretary in the Government while simultaneously holding positions in green companies. He is the lowest of the low in political circles and that is not an easy position to achieve, given the standard of completion today. Thanks John, I was forgetting that most of the readership here would be unaware that he was minister in the dept of Energy and Climate Change. Like the intrepid “explorer” Prof Turkey , who heads a business that wastes energy converting air-borne CO2 back into unburnt organic compounds, there seems to be no problem with such conflicts of interest as long as it’s for “the cause”. @greg, John Benton: Play the ball not the man. Yes, he has a conviction for perverting the course of justice but it doesn’t help deal with his idiocy if our first reaction is snark and ad-hom. His speedy rise from prison to quotable prominence does tell us that the man has made plenty of like-minded friends among left of centre big media. It perfectly illustrates why those of us of a more sceptical point of view have found it so hard to get a fair hearing in the MSM and have had to rely on blogs like this for a level headed assessment of climate science. …and he’s also partly responsible for the ridiculous situation we now have of us having to run our previously coal-fired power stations on wood pellets shipped across the Atlantic from the ‘States. I wonder if he thinks that ships run on fairy juice? Normally I would agree with you Chunk, but not this time. His past record of perverting the course of justice is very relevant to whether this distasteful individual should be given any credibility. How many Americans would hand their money to Bernie Madoff to invest on their behalf if he was released? Huhne’s record of dishonesty, to say nothing of his legendary arrogance, and his subsequent downfall and imprisonment should serve as a warning that this is a man never to be trusted on any level. Can’t agree, but that’s ok. Even if he saying one thing and believes something else, I think we’re still best served by addressing the idiocy of his words *unless* it’s possible to prove that he’s actually lying, hypocritical or both. It was never about science; it was always about politics! Newminister, We have only ourselves to blame. Our egos deceive us. Yes – well this is really not a concern. No country will accept legal responsibility for actions taken 150 years ago which do not violate any treaty. The UN has no power – nor does any international court. Not unless a country chooses to submit – which I predict will not happen. So I say let the chickens come home to roost. The problem is the do gooders trying to solve the “problem” by making energy, food and fuel more expensive. Not a few misguided people trying to push a rock uphill. No hurricanes rose above category 1 this past year for the first time since 1964. Surely some islands should be happy about that. If global warming continues the children on those islands won’t know what hurricanes are like the children in Britain won’t know what snow is like. Could current national policies reduce sufficiently to reduce warming sufficient to prevent the next glaciation? During the last glaciation, c.a. 90,000 to c.a. 20,000 year ago, the Laurentide Ice Sheet extended as far as 37 deg N latitude, covering New York and Chicago with similar ice sheets covering Leningrad and Moscow. Quebec was “only” covered by 2 miles thick ice. That would appear to be a more damaging “extreme event” than a warmer period with more CO2 and greater agricultural productivity. Markonis, Y., and D. Koutsoyiannis, Climatic variability over time scales spanning nine orders of magnitude: Connecting Milankovitch cycles with Hurst–Kolmogorov dynamics, Surveys in Geophysics, 34 (2), 181–207, 2013. The last interglaciation was only 12,000 years long. The current Holocene started about 11,700 years ago. When 95% of 34 year climate predictions running hotter than reality, what confidence can we have on models projecting that higher CO2 will provide sufficient warming to avoid the oncoming glaciation? What will be the legal arguments then – national policies prevented the warming that could have prevented these trillion dollar losses? “The main reason they did not press ahead then was that the scientific case is strengthening by the month.”. Translation : The scientific case was weak. Responsibility should be proportional to emissions since the beginning, the right hand plot here. The UK doesn’t figure very high here despite its long history. However, I don’t think disasters are easy to attribute. You can look at statistical increases in disasters, but that would not allow more than a percentage of each disaster to be attributable, and it would take decades to get robust enough statistical changes in, e.g., droughts, heat waves, floods, storms. Sea level is easier to attribute, and that alone has some costs. Then if there is a global fund pool, does the US become eligible to receive from it for their own disasters? I think they should be, but their damage costs are higher so the wealthy countries end up using up most of the funds themselves. Needs to be thought through more. Don’t waste any time thinking on it, jimmy dee. You are only dreaming. We won’t pay. Get over it. Jim D – should a higher concentration of CO2 actually decrease the frequency of disasters, do you believe that vulnerable nations should pay to CO2 producers? if it wasn’t industrialized countries … wouldn’t be any floods and droughts, no Hurricanes ans cyclones…? == crap! In the U.S. AGW lawsuits can be brought under two classes of legal theories. One would be brought under the common law nuisance case theory which allows aggrieved parties to sue for the violation of their right of quite enjoyment of their property. This area of the law is as old as the U.S. and has been used to stop or reduce activity like air pollution that is considered a nuisance. The second is citizen lawsuits brought under the existing environmental laws like the Clean Air Act, the Endangered Species Act, and NEPA. Now that the EPA and state governments are taking regulatory actions to mitigate AGW pollution, the courts so far have generally held that government action precluded the common law nuisance cases. Even if a plaintiff can prove damages are caused specific parties, they might have no legal recourse under the common law. The citizen suits generally are taken to force the government to take or not to take action, and they are still permitted. The lawsuits can be a way to get monetary damages, force regulatory action and/or score political points. They are not ways to find the truth because they are not proving anything as much as persuading a judge or jury to take your side. Its different than the scientific process, so greater scientific proof might not mean that much. This is completely off-topic, but I want to congratulate the Oklahoma Sooners for beating the Alabama Crimson Tide in the Sugar Bowl tonight. Amazingly, the Sooners won by 14-points despite being 14-points underdogs. I guess all the “models” that had Alabama easily defeating Oklahoma are wrong and didn’t predict the “pause” in the Alabama offense. Or maybe it was the big oil interests in Oklahoma exerting undue influence on the game. Or maybe the Sooners just played better. Not so sure this is off topic as we struggle with evidence here. What evidence would convince the Alabama faithful that Alabama is not the “best team”? Two losses in the last two games haven’t been enough. While they may be better overall than the teams that happened to beat them, some still proclaim they are still the “best” of all. Of course excuses can be found, such as they were not “up” for the Sugar Bowl. That excuse raises the question, “how can you be the “best” if you don’t get up for a major bowl game?” As with Climate theory, ad-hoc reasoning can support anything especially if you keep shifting your definitions. At that level of football excellence the wins are mostly natural variability random events. Such as the touchdown return on a field goal attempt. Once all things are relatively unknown variables the bounce of the ball confounds attribution. I believe Alabama lost because they had four costly turnovers. Oklahoma had only one turnover. Alabama fans might attribute the loss to bad luck rather than incompetence. WHT and Springer would suggest that it is mean reverting. Does any individual team have persistence? ie a greater win loss ratio. As that is US football,what would be the best win/loss ratio be for any team, in any football code (global) over time? Sea-level rise, though, isn’t an extreme event — its attribution is much cleaner. What about land level rise? Or fall? Due to global warming? Global cooling? Parts of continents rise, others fall. The sea level may or may not change as a result. Good luck with stopping tectonic movement. You’ll need it. But can you disambiguate all the other effects and *prove* that some flooding or some component of some flooding was caused by sea level rise in turn cause by CO2 and not development or land use change? Mike – you must have missed all the hysteria re: anthropogenic countinental drift. It horrifying! My understanding is that one side of the main island is subsiding while the other is being added on to. There is no real evidence that the total land mass has changed much, if at all. Sea level rise may be occurring, but it sure appears that subsidence is a much bigger problem. For example, NOLA – expected “rise in sea level” in 2100 – about 24 inches; amount of the expected rise due to subsidence – about 18 inches. Lots of similar examples in the US and around the world. Can we stop obsessing over the hypothetical harm in a hypothetical future, and address the real problems of today’s world? Please? And the rise has been steady and non-alarming for the past 100 years. Which means no attribution is necessary. The null hypothesis rules. Thank you for alerting me to the Anthropogenic Global Drifting! I will immediately head for the hills! It’s worse than I thought! “Sea-Level Rise from the Late 19th to the Early 21st Century,” John A. Church, Neil J. White, Surveys in Geophysics, September 2011, Volume 32, Issue 4-5, pp 585-602. So 0.69mm/year – and falling ocean volume? You got to really wonder who is right. And how long the ARGO rise can continue? I need to find me a few, shall we say, cooperative “climate scientists” willing to testify as “attribution expert witnesses”. We could make the silicone breast implant class action suits look like pikers. File in a few progressive states where the judges don’t much care about the law (OK, that doesn’t narrow it down by much), and Presto! Instant multi-million (or billion) dollar verdicts. Just the threat of an adverse judgment should allow us to extort billions from thousands of evil corporations stupid and evil enough to extract, transport, refine, sell or use fossil fuels. You sue everybody emitting anything, and the mere cost of litigation will force many to enter “global” settlements. Or at the very least, settle out with the corporations who can’t afford the cost of massive, multiple litigations, or the adverse publicity the MSM can be counted on to provide about how they are poisoning the atmosphere with “carbon”. The sad thing is, while I am not serious, I would be astounded if there were not already dozens of firms doing the ground work for just this kind of litigation. Talking to the “attribution experts” who are already making names for themselves. Letting their political partners in crime know if they might need a little legislation here and there to open the spigot. It doesn’t matter whether you actually have a claim. Not in post-modern litigation. You’ve missed one of the basic tenets of common law. Common Law only applies if the legislature has failed to address an issue. I.E. Within my city limits there is a height restriction on grass in commercial areas only. The city decided to exclude residential areas from a height restriction. Hence, my neighbor can grow his grass as high as he wants even though I can rightly prove that the height of his grass attracts vermin to our residential neighborhood. The city, by regulating some of the grass, but not all of the grass has defined what constitutes a ‘nuisance’. More then 6″ in a commercial area is a ‘nuisance’…in a residential area no height constitutes a nuisance. The same is true for CO2. Since virtually all states have taken ‘some action’ to address CO2 emissions…then common law doesn’t apply. And so we see that the looney, denialst conspiracy theorists among the extreme right wing who insist AGW is nothing but a power grab and a wealth redistribution scheme….um….actually have a pretty good point. Seriously Pokerguy, did you ever doubt what political skeptics have said all along? The real quackery is the continued nonsense that it ever was a “science” debate. Well cwon, I have to admit to a certain process not of radicalization exactly, but of a slow awakening. At the same time, I steer clear of paradigmatic interpretations because they are by definition distorting. I don’t believe that for most people on the left, the global warming movement is anything but sincere though deeply misguided. You didn’t list the worst actors of all which are the academics who appear rational and non-political but continue the farce of debating the “science” as they see fit and as if that is the true substance of the AGW movement. The Good German syndrome if ever there was one and just as outrageous. Meanwhile millions die in energy poverty and a billion a day is malinvested in carbon rationing and greenshirt fraud. The “consensus” of academia has either contributed, complied or gone on quietly with the movement while realizing it was politically and emotionally driven for decades. A huge set back for human reasoning and a brutal cost exacted on the weakest of the world. Why was it this way? It flattered their 60’s campus leftism as a start in the U.S. and EU. A close examination would confirm this group is on the wrong side (often the current winning side to be sure) of history and individual rights across the board. It’s the same statist establishment that needs to be eradicated at every level on a host of cultural assumptions that have sanctimoniously mainstreamed and normalized. AGW is an insidious perversion of basic reasoning, political correctness and totalitarian indoctrination rolled into a single coded, Orwellian meme. If the technically advantaged didn’t speak up and directly to the points what chance did a poor stoop with a public education have watching them discuss spaghetti charts as if these were the essential of the movement and debate?? Be careful what you wish for. Mitigation policy is a manifest failure and I see no way to change that. Given that reality, there are always positives and negatives to any human action. Perhaps it is just to transfer some of the benefits of emissions to those who are harmed. But it is a dangerous game. I find it quite incredible that a scientist suggests that we shouldn’t strive to understand and explain what is going on around us. ‘It’s too hard ‘ – doesn’t cut it. Yes we should strive to understand. Premature claims of understanding are the problem. My misunderstandings come from the understandings of others. However, recognizing that the physics cannot tell us what happens when you add more CO2 to the atmosphere from current levels, and being open and honest about it, is NOT the same as saying “It’s too hard”. It is far better to state that we do not know the answer, than to try, and then claim that the problem has been solved, when it hasn ‘t been. When one person can’t find science fun and interesting, other people will pick up the slack. Is this the Chris Huhne that recently spent time in jail after being convicted of perverting the course of justice by pressuring others to take responsibility for his driving license penalty points? Yes. Feb 4th is doubly famous. “I reckon we’d be able to show anybody in the world how to do a burnout,” he said. You mean like the Stadium Wave model that helps accounts for the frequent pauses in the global temperature record, substantiating the ideas of Dickey? Or the SOI model of global temperature fluctuation that was proposed by Bob Carter? Or the orbital forcing models proposed by a host of people including Scafetta and Wilson? After these natural fluctuation terms are included in the thermodynamic analysis, there is no doubt that a near monotonic trend in global energy retention is operational. Temperature, also known as thermal energy, is but one of the ways that free energy manifests itself. As it is clear that the free energy continues to increase, it is only a matter of time before fluctuations in the non-thermal terms drop down, allowing for the temperature to rise. Take for example, the return of El Nino conditions predicted for 2014 that will allow the thermal energy component to reemerge. These are all very well-understood concepts of the Thermodynamics of Atmospheres and Oceans, intuitive to scientists who studied statistical mechanics and thermodynamics within a physics curriculum. Fun stuff, not boring. The anthro warming signal since 1880 is 0.8C and 1.2C on land. Compare that to the baby-chaos of perhaps 0.1C residuals. webster has very lately come to it and still doesn’t understand the implications a 0.06 to 0.08 degrees C/decade rise. The tropical Pacific has remained neutral with respect to the El Niño–Southern Oscillation (ENSO) since mid-2012. All the main ENSO indicators remain well within neutral bounds; for example, sea surface temperatures in the tropical Pacific are very close to their long-term average. International climate models surveyed by the Bureau of Meteorology indicate the persistence of this neutral ENSO phase through at least the austral autumn. This would then mean the tropical Pacific would have been neutral (i.e. in neither El Niño nor La Niña territory) for approximately two years. The models can be seen here – http://www.bom.gov.au/climate/enso/ – although the accuracy beyond three months is no better than random. Unlike webby – Claus Wolter is the world’s leading ENSO expert. I wouldn’t either – but the Pacific is in a cool decadal mode and these last for 20 to 40 years. The probability is for more frequent and intense La Nina over decades to come. The monotonic increase in energy is much more rhetoric than reality. The scientific reality is that the available data does show dramatic discontinuities in cloud in response to shifts in ocean and atmospheric circulation. We do of course understand that low frequency variability on decadal to centennial scales is very real – and CERES is confirming that changes in ocean and atmospheric circulation cause large changes in TOA radiant flux. What is really boring is webby’s rejection of science and reality – and the substitution of his own alternate reality. Don’t blame me for being able to follow consensus climate science, and phrase the Thermodynamics of Atmospheres and Oceans in a way that substantiates the idea of CO2 as the control knob. Does he not recognise the quote? It comes directly from the webster. The residual warming due to greenhouse gases is at most 0.08 degrees C/decade. This is merely one aspect of the problem. WebHubTelescope: Take for example, the return of El Nino conditions predicted for 2014 that will allow the thermal energy component to reemerge. Do you have a citation for that prediction? Not that I doubt someone made it, but I’d like to know more. James Hansen predicted a return to El Nino conditions in 2013, but it didn’t happen. Did they actually predict the 15+ year hiatus, or model it after it had started? The temperature offset due to the CO2 control knob forcing was predictable, given a TCR of 2C. It was clear in 2003 – once it was known that the system had shifted after 1998. I wrote about in in 2007 – http://www.americanthinker.com/2007/11/enso_variation_and_global_warm.html – the story is of course more complex than an American Thinker article can encompass. A 40% chance of El Nino and a higher chance of neutral conditions in June not only doesn’t mean that El Nino is predicted – but in fact has diddly squat chance of being more correct than tossing a coin. It is as well a loaded coin – weighted in favour of more frequent and intense La Nina and less frequent and intense El Nino. A basic ENSO fact that seems difficult to assimilate for some of the Borg collective CAGW cult of groupthink space cadets. There are multiple and complex dimensions of ENSO – wider Pacific variability that need to be put into a broad context. Webby is just amateur hour down on the funny farm. The term ‘green house is not a a scientific explanation for global warming, it is merely a poor analogy. There is no structure on earth that functions like a greenhouse. The IPCC created the term greenhouse gas but never gave a scientifically satisfying account of how it worked. For example, there are plenty of measurements of the specific heat of CO2 which show it does not satisfy the criteria of a ‘greenhouse gas’. While CO2 is less than one percent of the atmosphere, nitrogen at 70%, absorbs far more heat. Not only that, but even if CO2 were the culprit the IPCC never explained why it stopped so dramatically in 1940 and 1997. As it has, the industrial world will always help developing countries improve their standards of living, but in the end the responsibility is theirs. Given the weasel wording of the actual papers, whose conclusions are much milder than those of Huhne and given the number of papers that state the exact opposite, then there is absolutely no chance of even reaching any court with any standing. There is no way to separate out warming as a cause of these events, never mind the much more elusive manmade warming, which can only be discerned by dint of modelised assumptions that are now deeply discredited. The blame game will certainly intensify argumentation in yearly UN climate circuses…sorry, conferences. In short term, any kind of climate treaty will be harder to reach. Damage compensation just deepens the divide and disagreement between developed countries and the so-called developing countries. Blimey I thought it was only Mosher who confused the gridded, numerical climate models that are used for for IPCC conclusions with other types of non-numerical models. WHT is at it too now. As large uncertainty becomes increasingly recognised, precommitted authoritarian-leaning politicians slavering over the prospect of more taxes and bureaucracies, become increasingly desperate to act before any possible collapse of the case for CAGW. People in the US may not be aware of who Chris Huhne is. He was appointed secretary of state for energy and climate in our coalition government in 2010. In 2003 he persuaded his wife to take a speeding ticket that was his responsibility. This came out when his wife left him after he had an affair with a woman on his campaign staff. He was charged with “perverting the course of justice” and protested his innocence, then changed his plea to guilty and was sentenced to 8 months in prison. So the idea of him warning that “there will soon be a legal reckoning” over climate change is quite comical. Yes this is the same Chris Huhne. A convicted liar recently released from jail. He’s also, quite remarkably given he’s not long out of prison, back giving advice on policy (read government grant seeking) to green companies. When a large industrialised nation has largely opted out of a commitment to reducing CO2, it no longer has a dog in the fight; business as usual for the majority of research attempting to “prove” a link. Add a lawsuit into the mix and there is now a strong incentive to fund additional research to falsify existing theories, offer alternative explanations and, crucially, to subject weakly reviewed but widely cited existing research to decent scrutiny. I call that a win. Excellent. The USA can obviously afford to compensate, handsomely, all those who put their hand out. Or maybe not. The USA hasn’t got any money – they would have to borrow some. Ah, minor problem, possibly. The US has plenty of money — our real per capita GDP is at a record high. We have chosen to carry a large federal government debt in order to have lower taxes. No, we have chosen to carry a large federal government debt since we chose to add $11 Trillion to the Debt Held by the Public by just the Increase in spending on Social programs. The so called Bush tax cuts ( of which there are none since Obama embraced tax cuts for the middle class and the top rate is back to the Clinton era rates) only accounted for $2,5 Trillion of the Debt. Had Adjusted Gross Income grown by the same rate during Bush’s 8 years (28%) as it grew under Clinton (73%) then the Debt under Bush would have been significantly smaller. We have a massive Debt because of increased Social spending of $11 Trillion since 2000, and because jobs have grown by only 2% since 2000 compared to 20% under Clinton and Reagan. If jobs would have grown 20% per 8 years we would have 35 million more jobs than we do today. That’s right. When the government wants to spend more money, it can get some more money by borrowing or by raising taxes (or by doing both). Borrowing is less painful than raising taxes, and if there’s inflation, the government can in effect pay back less than it borrowed, which is a pretty good deal. But then lenders aren’t dummies, so they demand higher interest rates if inflation is lowering their real return. Also if a government gets deep enough in debt to make lenders nervous about default, they will want higher interest rates. That’s interesting, Max especially since it seems to go contrary to your theory of seniors not caring. After all I won’t be around long enough to worry about what happens when the US can longer pay its financial obligations but you will be. I care not because of you but because I have children who will inherit that debt. It’s about a cool half million per person right now and if you die without paying it off it gets divided up between the living. Interesting times you’re going to live in, Maxie. I’d worry more about wracking up current debt which can be counted rather than hypothetical debts due to fossil fuel consumption. After all, if current debt is reigned in and global warming becomes a personal problem you can start borrowing to fix it at the time as needed. I see. The “new economics”. This is where the country borrows its way out of debt by living beyond its means, in order to have lower taxes, more unemployed, a greater percentage of citizens incarcerated, and a higher per capita GDP as one percent of the population line their pockets with money borrowed by the Government, hopefully to be repaid sometime in the future by the citizens who have benefited from paying no taxes because they are incarcerated, unemployed, bankrupt, or receiving minimum wages in order to create more jobs to stimulate the economy. Does that just about cover it? When you owe sixteen or seventeen trillion dollars, I suppose you really have no intention of paying it back. I wouldn’t. Stiff them I say, they’re stupid for lending that much. It just proves how gullible lenders can be. Yes, that “large federal debt” will simply pay itself back without anyone being taxed. No, wait, we’ll just tax the top 1%. What’s that? They don’t make enough to come even close? OK, we’ll tax the top 10%. Huh? That still doesn’t come close to the 17 trillion we have already over spent? What’s that you say? Federal spending is projected to grow beyond total GDP in about 20-25 years based on current obligations alone? Well, let’s just add massive new spending on “alternative energy” boondoggles and saddle the economy with a massive job killing energy tax. 17 trillion is just the national debt. It’s the nearly 10 times that much in unfunded future liabilities that is more worrying. The more future you have the more you should be worried. Max_OK believes we should pile on more of it which, if you’re 70+ years old is probably a personal good thing but for people who will be around in 2035 when it all becomes insolvent it should be a great concern. No, we won’t be paying off our federal debt. We will carry it, as we always have, and it will be diminished by inflation, as it’s always been. Climate policies focus on saving the waelthy people of 2100. It won’t be long before the current poor victims of climate policies start suing…. Our research strategy focuses on the collective behavior of a network of climate indices. Networks are everywhere – underpinning diverse systems from the world-wide-web to biological systems, social interactions, and commerce. Networks can transform vast expanses into “small worlds”; a few long-distance links make all the difference between isolated clusters of localized activity and a globally interconnected system with synchronized  collective behavior; communication of a signal is tied to the blueprint of connectivity. By viewing climate as a network, one sees the architecture of interaction – a striking simplicity that belies the complexity of its component detail. Marcia Wyatt – stadium wave. Webby fundamentally misunderstands the nature and purpose of the stadium wave concept – and reduces it to a single element in LOD. I am inclined to htink he does has the same fundamental misunderstanding of Scafetta as well – although I do find this sort of stuff unreadable. Scaffetta’s short term projections are at least proving more correct than the IPCC. So we have to wonder – if webby is using the astronomical harmonic model – why the radically different (I presume) projection? McLean et al – referred to by webby as the Carter SOI method – used first derivatives to find that ENSO was by far the biggest contributor to temperature variability. Others such as Stockwell and Cox and Bob Tisdale use a cumulative SOI to account for persistence of ENSO modes. Something webby rejects out of hand for no reason at all merely handwaving and bluster. Well we are used to that. Essentially it is all just nonsense loosely attached to high falutin’ jargon. Now he will insist that I don’t have the maths chops to understand his simplistic method. Please I could explain it to a 10 year old. What I can’t explain to webby is where it all falls over in a screaming heap. You boys ought to start thinking, or at least entertain the possibility, of ENSO as an effect of natural variability instead of a cause. Pukite’s error is almost certainly that he thinks ENSO is a zero sum game. It may be but there’s no way to prove it in either the short or long term. Frequency and magnitude of either La Nina or El Nino may change relative to the other over longer time frames than we have reliable data out of which to statistically tease out any non-obvious trend. Pukite’s other error is assuming that a near constant solar constant means the ocean/atmosphere must absorb and emit a near constant amount of energy. The problem with that is albedo and not really knowing much about how it changes only that it does change by a significant amount. Pukite again assumes it’s a zero sum game and there’s no basis for that assumption. A huge and varying amount of solar energy is reflected instead of absorbed. A one percent variation in global average albedo is 2.5W/m2 more or less to warm or not warm the surface which is equal to the supposed anthropogenic forcing. Albedo is the elephant in the room. Write that down. ENSO causes climate extremes across and beyond the Pacific basin; however, evidence of ENSO at high southern latitudes is generally restricted to the South Pacific and West Antarctica. Here, the authors report a statistically significant link between ENSO and sea salt deposition during summer from the Law Dome (LD) ice core in East Antarctica. ENSO-related atmospheric anomalies from the central-western equatorial Pacific (CWEP) propagate to the South Pacific and the circumpolar high latitudes. These anomalies modulate high-latitude zonal winds, with El Niño (La Niña) conditions causing reduced (enhanced) zonal wind speeds and subsequent reduced (enhanced) summer sea salt deposition at LD. Over the last 1010 yr, the LD summer sea salt (LDSSS) record has exhibited two below-average (El Niño–like) epochs, 1000–1260 ad and 1920–2009 ad, and a longer above-average (La Niña–like) epoch from 1260 to 1860 ad. Spectral analysis shows the below-average epochs are associated with enhanced ENSO-like variability around 2–5 yr, while the above-average epoch is associated more with variability around 6–7 yr. The LDSSS record is also significantly correlated with annual rainfall in eastern mainland Australia. While the correlation displays decadal-scale variability similar to changes in the interdecadal Pacific oscillation (IPO), the LDSSS record suggests rainfall in the modern instrumental era (1910–2009 ad) is below the long-term average. In addition, recent rainfall declines in some regions of eastern and southeastern Australia appear to be mirrored by a downward trend in the LDSSS record, suggesting current rainfall regimes are unusual though not unknown over the last millennium. reach values in red color intensity over 200. ENSO is not zero sum over the Holocene. We haven’t seen anywhere the extremes that climate is capable of. ENSO is part of a complex and dynamic system – chaotic. Perhaps you should do more reading and less thinking Jabberwock. What do we really know about cloud? Is the name calling a necessary part of regurgitating the work of others? What is the stadium wave about? Each of these oscillatory modes we are used to treating as isolated components in a reductionist framework. What the stadium wave concept suggests is that these are nodes on a global network through which signals propagate. A change somewhere in the network reflects and is alternately amplified and diminished through powerful – in a case of the whole being more than the parts. Abrupt and nonlinear change emerging a every step. It is the essence of chaos in climate. John Adams expressed it at the end of the last century as tremendous energies cascading through powerful systems. Many other people have tried to explain the concept to an incredulous world – in many different ways. A single element – e.g. length of day – is not the stadium wave. Somewhat artificial is a bit of an understatement for a paradigm shift. But hey – right over their heads aye Jabberwock? You’re doin’ a hell of a job. Most climate skeptics believe that carbon dioxide causes some warming and are therefore part of ‘the consensus’? Don’t expect someone of Huhne’s limited intellect to understand such niceties. Even if he did, remember this is a convicted liar we are dealing with. He has vested interests in BIG GREEN to promote. Here is a serious attempt to answer your question from the skeptical point of view. I apologise for the length. Note that this is a genuine attempt to reach out across the philosophical divide and find common understanding. The climate is a chaotic system. Such systems are subject to unpredictable internal variations and oscillations. The main difference between skeptics and nonskeptics concerns the role ascribed to natural variation and in particular beliefs about the time scales over which these variations can play out. The nonskeptics tend to think of natural variation as being a very short term phenomenon – essentially weather. They tend to rule out the possibility of any natural variation over longer time scales. Hence when a change in climate over a longer timescale is observed such as the late 20th century increase in temperature they insist that it could not be ascribed to natural variation and must have been caused by some sort of forcing. The argument then goes that CO2 must have done it since we can’t think of anything else. However a direct calculation based on the radiative properties of CO2 reveals that it doesn’t provide anything like a big enough forcing to do the job. So the final step on the route to CAGW is to assume that positive feedbacks must exist within the climate system amplifying the very weak direct effect from CO2 into something big enough to cause the late 20th century increase. Skeptics however don’t see natural variation as being limited to the short term. We believe that natural variation occurs also over much longer time scales. Or to be more precise we see absolutely no reason to assume that natural variation should be limited to short timescales. Hence a skeptic tends to view the late 20th century increase in temperature as being quite possibly the result of natural internal variation. Ignoring the lunatic fringe, most skeptics have no problem with CO2 causing some warming. But when we do the radiative calculation and see that the size of the direct effect from CO2 is small we are quite happy to stop there and ascribe the rest of the temperature change as being most likely due to natural variation. We see no reason to assume the existence of large positive feedbacks in the climate system for which there is very little evidence. Indeed there is a considerable amount of evidence that feedbacks in the climate system are more likely to be negative overall than positive, but that tis another story. Lets get back to this crucial question of the timescale of natural variation and why skeptics think natural variation exists over longer timescales. 1. The harder we look the more variations we see over longer timescales. El Nino/La Nina is perhaps the most famous of these internal variations and it takes place over a timescale of years. Other well known ocean oscillations play out over decades. The harder we look the more of these natural oscillations we seem to identify. It would be foolish to think that at this point we understood them all. 2. Most identified natural variations involve changes in ocean currents and temperatures. Particularly in the deep ocean the timescale for these events can be very long. It is hard to think of a reason to limit the timescale of variations involving such processes. It is entirely conceivable that oscillations which play out over timescales on the order of a century or longer could exist in the deep ocean current system. 3. When we look back at the history of climate in the Holocene we see a lot of variation playing out over longer timescales. We have names for them. The Medieval warm period – the Little ice age – the Roman warm period – the Minoan warm period – to name but a few. These look like natural variations over longer timescales of precisely the kind that could explain the warming in the late 20th century. 4. To a nonskeptic these longer term historical variations in the climate are problematic because having ruled out natural variation on such timescales, each and every one of these climactic events now needs to be explained with an associated forcing. So what forcing caused the LIA or the Roman warm period? Assuming you manage to find an answer, have you checked whether the same cause might be responsible for late 20th century warming. Some nonskeptics find these historical variations so problematic that they would prefer to argue that they didn’t exist. Hence the hockeystick and the arguments that swirl around it. One example of long-term natural variation might be undersea earthquakes causing a disruption or even a shift in some major deep ocean current. We may never have any way of knowing if, when and where such events have occurred in history. Weather is chaotic. Climate is not. For billions of years the earth’s climate has remained within bounds suitable for life despite a faint sun in the distant past and huge perturbations to the system ranging from continental drift that clumped everything together in a single continent, asteroid/comet/meteor impacts, adverse solar weather, super volcanoes, atmosphere changing density and composition, and God only knows what else and it always bounces back. Those aren’t butterflies I enumerated. This is so far from chaotic it’s laughable to call it that. Write that down. You don’t need a model to explain something that’s imaginary. Fairy tales will do just fine. @David Springer: You missed. Get a more accurate buzzer gun. 1. Chaotic does not mean unbounded or uncontrolled. Just look at the Lorenz attractor. 2. The division between climate and weather is pretty much a semantic question of no physical significance. 2. At the heart of all climate models is a set of coupled Navier Stokes equations. Hence chaotic. Huhne is a convicted liar and a crook. Why take any notice of anything he says or writes? Ian, he’s keyed on the turbulence, but why turbulence? As for Huhne, he’s inextricably caught in the turbulence, coming up repeatedly for the last time. Not at all. Experiments show that CO2 traps infrared radiation, and theoretical calculations give a firm number for its radiative effect. Then the study of past climate changes confirm CO2’s effect and gives a fairly good estimate of the feedbacks. Not surprisingly, we’re seeing higher temperatures with higher CO2. The surprise would be if we didn’t. If the Medievel Warming Anomaly was global (unlikely, according to PAGES 2k), it would make our current situation worse, not better, since we’d have to worry about an upward chaotic fluctuation on top of CO2 warming. Ian H appears to have already identified most of the points I would have made so there is no point repeating them again Gareth. You care to comment on that? God you do talk some utter nonsense David Appell. Throughout geological history there has been little relationship between CO2 levels in the atmosphere and temperature. As for your claims about the MWP not having been a global event, well, that’s denialism. I think you’ve swallowed one of Mike’s hockey sticks. That is a good summary of the skeptic position (or one strand of it). I was looking for a direct answer to Chris Huhne: where are the climate models that match the late 20th C warming without ascribing “most” of it to CO2? I have seen mathematical models of natural climate cycles discussed here, but I am not sure if/where any with those characteristics have been published. It would be fair to point out that the GCMs, while “hindcasting” the late 20thC warming did not predict the “pause”. But unless alternative models have been developed that also fit the warming, it seems to me that he has a point: the GCMs are the only game in town. I’m not a scientist, but I read what scientists on blogs like this write. They tell me that during historical times, based on written reports from most of the civilized world, the ‘TOE’ (undefined, but widely cited as a ‘symptom’ of CAGW) has been both noticeably colder AND noticeably warmer than today’s TOE, during periods where there was no arguable ACO2 signature. Therefore, until there is some evidence that the climate is doing something unusual, there is no reason, other than basic scientific curiosity, to build models to explain anything about the climate OR for the government to have a Climate Change Policy. There is CERTAINLY no requirement that I must have a superior, working climate model before I can legitimately object to the use of existing climate models, which are poster examples of GIGO, to justify the government taxing and regulating any and all activity which is even peripherally related to energy production and consumption, as they are apparently bent upon doing. Chaotic at least means a butterfly effect, IAN. No butterflies no chaos. What are the butterflies? I pointed out huge perturbations like major asteroid strikes, Pangaea breaking up, super volcanoes, sun increasing in power by 10%, atmosphere becoming thinner and 20% O2, and stuff like that. The climate reaction? About as chaotic as pushing a pendulum buddy. Pendulums aren’t chaotic. Earth’s climate always returns to very slight deviation around a center point just like a pendulum. If you don’t understand that you don’t understand much at all. Ah. I found your problem. You don’t know the difference between the actual climate and a numeric climate model. It’s a common problem amongst climate boffins so don’t feel too bad. They have pills now to help you sort out what’s real and what’s fantasy. Ah. I found your problem. You don’t know the difference between the actual climate and a numeric climate model. It’s a common problem amongst climate boffins so don’t feel too bad. They have p-i-l-l-s now to help you sort out reality from make-believe. Ask your doctor. Not at all true. 200ppm CO2 during glacial epics and 280ppm during interglacials reliable and accurate enough from ice cores going back a half million to a million years. The fly in the ointment is atmospheric temperature change prededes CO2 change. That’s because the level in the atmosphere is a function of ocean temperature not air temperature. Non sequitur. If we only had revolvers so Russian Roulette was the only game in town it doesn’t follow that we have to play it. If climate models were shiit sandwiches would we all have to take a bite? Experiments here show that David Appell doesn’t know the difference between in vivo and in vitro. CO2 impedes surface cooling in vitro. Cancer cells are immortal in vitro. “CO2 impedes surface cooling in vitro. Experiments show all matter “traps” infrared radiation. If you can provide any matter at all that I cannot heat, I will provide you with an abject apology, possibly even a buttock baring in the venue of your choice if you pay expenses. Nope. In vitro literally means within glass. In this case laboratory glass. Experiments characterizing CO2 optical properties are literally done within glass. In silico means in a computer model and wasn’t even coined when Latin was still a living language. In vivo means within life in this case I refer to the living world so there’s a bit of a metaphor there but not much. Write that down. Heat and infrared are not synonyms so it doesn’t follow that something which does not absorb infrared radiation cannot be heated. I can heat two sticks by rubbing them together. The heat is not due to absorption of electromagnetic radiation. Heat is a mode of motion. All matter is in motion hence all matter is heated. At absolute zero matter ceases to exist. Winks out. Sort of like intelligence winked out on your response. I dunno. It’s a hard choice – who to believe? Wally Broecker and hundreds of the world’s top climate scientists? Or Jabberwock? Pretty much a poem to live by – thanks Mr. Carroll. Nonlinear phenomena characterize all aspects of global change dynamics, from the Earth’s climate system to human decision-making (Gallagher and Appenzeller,1999). Past records of climate change are perhaps the most frequently cited examples of nonlinear dynamics, especially where certain aspects of climate, e.g., the thermohaline circulation of the North Atlantic ocean, suggest the existence of thresholds, multiple equilibria, and other features that may result in episodes of rapid change (Stocker and Schmittner, 1997). are the main source of nonlinear behavior, and thus one of the main sources of uncertainty in our attempts to predict the effects of global environmental change. Butterflies is of course a metaphor arising from the topology of the Larenz strange attractor. In reality it is small changes in any of the sub-components of the systems – control parameters in the language of chaos – which may trigger abrupt and non-linear responses. O2 and N2 do not interact with IR photons directly – but are warmed in collisions with greenhouse gases excited into a higher state of translational kinetic energy. They certainly do emit IR as anything does at the right temperature. I am intrigued by the idea of matter disappearing up it’s own fundament at zero Kelvin. Probably not – unless by the conservation of energy it was accompanied by a massive energy release. What actually happens is that the kinetic energy of atoms and molecules is zero. What an odd little thread. Indeed – I wonder whether weather/climate can be described by assuming that positive feedbacks dominate over the short time and negative feedbacks dominate over the long term. Note “dominate”, so there would be some “outliers” that are the reverse. This would certainly explain the significant variability over the short term, and the fairly significwnt long term stability. I am not sure how your unsolicited response relates to what I wrote. You may have inadvertently responded to what you wished or thought I had written, rather than to what I actually wrote. Rather than repeat myself, maybe you could read my words, slowly, possibly sounding them aloud, if you have any difficulty comprehending simple English. Is English not your native tongue? If you still cannot understand the concept of matter absorbing EMR (including infrared radiation), I can attempt to explain it to you. A vacuum allows EMR to pass without hindrance. I do not consider a vacuum to be matter. You may. As for your claims about the MWP not having been a global event, well, that’s denialism. real science that is. Not the phony stuff from the team (hiding data and declines). That’s false. CO2’s absorption spectrum didn’t change in 1850 — it’s been the same since the Big Bang. you need to realize that these data (1) have huge error bars (2) come mostly from carbon cycle models (3) occurred at a time when the sun was cooler (about 4% cooler 450 M yr ago, for example) (4) occurred at a time when the continents were in different places and of different shapes, which changed the Earth’s albedo. Nothing about the past says CO2 isn’t a greenhouse gas. Although one wonders what the volcanic contribution was. Although I am inclined to take paleoclimatic models with a pinch of salt. That’s also true of an atmosphere that’s free of greenhouse gases, such as an atmosphere solely constituted of N2 and O2 (although O2 and UV radiation entails the production of some O3, which is a greenhouse gas). N2 and O2 only absorb a negligible amount of infrared radiation. For all practical purposes, those two gases are as good as a vacuum — they just let all the radiation through, as they do radiation in the visible spectrum — although pressure broadening entails their having an effect of the absorption lines of the true greenhouse gases mixed in them. Reply to Ian H ==> Very Nicely Done. Perhaps you should expand this into a full fledged essay and post it either here or elsewhere. I, for one, look forward to it. Springer ==> Even the IPCC agrees the the Earth’s Climate system is a “bounded non-linear chaotic dynamical system” No sense arguing with anyone here about it. If you wish, I can give you a three book syllabus that will bring you up to “walk-about acquaintance” with the topic. AHH white guilt on steroids. Watch the chest beating from the western world to bemoan their wealth, to make browns, blacks and yellows feel good, or at least the people of pallor do so in their own skins. With no industrialization there would be orders of magnitude less life and property in peril. The whole crap does not make sense as it is. It would be a valiant effort to establish at court that past actions of defendant, causing all grandparents of plaintiff to survive their childhood were against nature, for otherwise plaintiff could suffer no harm whatsoever. It must be a strong case indeed, because said proposition is true, is it not? It’s a huge pile of manure and opportunistic third world countries hope to get some international kangaroo court to sift through it for them looking for a pony. The recent paper by Fraser Lott says this. There are several fundamental problems with this flimsy piece. Firstly, the Environment agency report specifically did not blame AGW for the year 2000 floods nor subsequent ones. I was on their Flood defence committee in the South West and read the reports. It does however have a politically appointed climate zealot Chief Executive in Smith. Surely the worst leader ever to grace any Govt Quango? Secondly, it was an academic study by Myles Allen at Oxford University-late of the IPCC and whose work is dedicated to proving AGW -who pointed the blame at Agw for the flooding. Thirdly, we do not have national rainfall records from 1766. We have very patchy National records from 1910 and rather more reliable ones from the 1960’s. I recall seeing a tv documentary about so-called “rogue waves”, which are capable of sinking big ships without trace. It used to be thought that such extreme waves were the stuff of legend, until they were actually observed. The bit I found interesting though, is that recent satellite observations have shown that they occur several orders of magnitude more frequently than a linear probabilistic model would suggest. The point I’m trying to make here is that we should perhaps first come to a thorough understanding of the underlying mechanisms of extreme weather events before attempting to associate them with AGW, or anything else for that matter. Our current love affair with trying to explain things with statistical models could similarly leave us several orders of magnitude away from the truth. We know enough about the water levels and catastrophic consequences of Europe’s greatest flood, the St. Mary Magdalene’s Flood. The fact that it occurred in the summer of 1342 should not make it any less of a flood. The cyclonic conditions in operation for the 2002 floods were operating back in 1342…only worse. How does one come to understand climate while trying to treat such past events as faded sepia photos in the bottom of a drawer. A big flood is a big flood, right? A Genoa Low is a Genoa Low, right? The only real diff, as others have pointed out, is the naughty industrialisation which enables more of us to survive such disasters. Tony, we were talking elsewhere about “watershed” (no pun) moments when climate changed profoundly and caused profound change. What about the Great Famine beginning in 1315? It seemed to set the stage for a bad century across Europe, and it was the result of extended wet with cooling. Even when conditions improved, people and seed stock were so devastated that there was no immediate remedy, The Medieval Warm, while it contained a famine or two, had supported more life and commerce than could be maintained after 1315. Unlike the Black Death, the Great Famine killed you slow and did not have any ironic upside. Some see it as one significant cause of plague and war to follow (though the Flanders mud was so impossible it delayed a war). One might say the MWP ended with both a bang and a whimper, and, yes, on can put a date to it. What do you think? As you know I am working my way back from 1538 and obviously come across intermittent periods of great change which may, or may not be, a noticeable transition from MWP to LIA. However, until I have evaluated all the material gathered-of which much thanks to those who have made an enormous contribution-i don’t want to be definitive as to whether there was one watershed or possibly a number of smaller events (cataracts?) that meant the climate gradually decayed rather than achieved this in one big bang. What a great reference to the July 1342 flood. It came after a prolonged period of heat and drought which caused the water to run off the hard soil. Fortunately we have the excellent Merle weather diary from the exact time. Here is the record for june and july 1342. Obviously this is all entirely anecdotal of course, and I am sure we will both agree it is nowhere near as reliable a weather record as lumps of dead trees. June. 1st, rain, with rather strong W. wind. 2nd, light rain. 3rd, fog. 5th and 6th,considerable heat. loth and 11th, rather strong N. W. wind. 7th, 8th, 9th, and loth, rain.12th, 13th, 14th, and 15th, rain. 16th, very heavy rain, which, by its own power, together with that of the preceding rains, penetrated considerably. 17th and 18th, light rain. 19th moderate rain at Oxford ; but there was extremely heavy rain in certain parts at a distance of seven English leagues°’ from Oxford. loth, heavy rain with severe hail and thunder at Oxford, but in certain parts, at six leagues distance, there was not much rain. 21st,much rain. 22nd, rain, with light wind. 23rd, light rain, with rather strong wind. 24th,heavy rain, with much thunder and lightning. 25th, rain. Last day, light rain. light wind, with rain. 5th, much rain. 6th, heavy rain. 8th, wind, with very light rain.loth, 11th, 1 nth and 13th, very strong W. wind. loth, extremely light rain. 12th, light rain. 14th, light rain in certain parts of Lyndesay, and in certain parts heavy rain.15th, rain. 16th, light rain. i-th, heavy rain, with strong S. «’. wind. 18th, rain.19th, rain, with thunder three or four times. loth, light rain. 27th, light rain. 24th and 30th, extremely light rain, as light as possible. 31st, rain. You should get a Korean Translator and plow through the annals of the joseon dynasty. 1,893 books covering 1392~1863. Daily records. which is a straw-roofed house, and stayed there (Bae et al. Tony there is record of a “great summer drought” in southern Britain in 1342. I wonder if that was the ground hardener before the wet. The Magdalene Flood was more a Central European affair, but interesting that a similar dry-to-wet shock may have been experienced in Hampshire parts. I know it’s felt by some that, starting in the mid-13th century, agriculture was harder not because of a single repeating weather effect but that conditions were less predictable, with increasing tendency to extremes. (Now that’s something an Australian can understand, since that’s all we ever get.) But life seems to have got easier with warmer weather, drought or no drought, in the period of relief between Black Death and the cooling around 1400 which led into the first trough of the LIA (none of which should be defined too neatly of course). Regardless of how we feel on the benign coastal fringe of NSW where the cool is bracing and tends to bring rain if it occurs in summer and autumn, history seems to keep affirming that cold is a great killer of men. Embarrassing? Hardly. Losing the war in Vietnam was embarrassing. An international kangaroo court rendering an adverse verdict against the United States with no authority is entertaining not embarrassing. Not really. The inevitable outcome of a wrongful use of Americsn resources and lives. More embarrassing is that we ever got involved. A war against tyranny misrepresented as a last gasp of colonialism. We thank John Kerry for the late insight. Yeah, because the Vietnamese people are so much better off because we lost. Just like the North Koreans. If only it were true that the wrongful use of resources and lives always resulted in a just outcome. Why not? Human activity is having unique influences on the climate. If unusual things are happening they are indeed candidates for being effects of human activity. So is Canine Influence. But you do not see them wasting time and resources worrying about it. Only in your imagination, lolzee. Care to tell us when human influence started? With data. Lets say that 20 years from now we’ve had 20 years of cooling and it is generally understood that the whole global warming thing was … wrong. Is it possible that smart lawyers will assert in court that companies that invested in carbon mitigation technologies and governments that invest in mitigation and taxpayers that paid for faulty research and unneeded mitigation were victims of fraud? Will they do this by suing universities with deep pockets (endowments) and governments and others who knew or should have known or failed to supervise their scientists. Will these lawyers find sloppy science or dishonesty or greed (not a legal term but one that works well in the press) responsible for billions/trillions of dollars spent on unnecessary regulation, mitigation and technology development? Would there be any recriminations? he goes on to ask. Well of course not. The taxes will by then be entrenched, governments by now addicted to them, totalitarian supporters will be happy, and the search for new tax-raising scares based on politicised science will continue. An end run since their campaign to convince the populace of the developed nations is not working, force them into poverty by having impoverished nations get all their money. It is so transparent, yet the effectiveness will depend upon the spines or lack thereof of those in power. There have ALWAYS been droughts. There has ALWAYS been severe weather. Impoverishing the world back to the stone age will not change those facts. But the watermelons will try. I’m kind of glad in some ways to see the Guardian allowing Huhne, a convict fresh out of prison for lying on oath, to spew more nonsense from the pages of their wretched paper. This is just the kind of thing that will hasten the end of this already hugely loss making company. While it makes little difference whether global warming is caused by the HEAT or the CO2 released when fossil fuels are burned, it is very important in determining whether CCS or other carbon “mitigation” practices can protect or be held liable for the success or failure to achieve actual temperature modification. When it is finally acknowledged that heat, not CO2 is responsible for global warming, how liable would a company be who promoted CCS before the 97% issued the new consensus ? Warming – always – acts in two ways of: hurricanes, extra-tropical cyclones, tornadoes, etc. .. The amount of energy increases (eg hurricane strength increases) but gradients decrease (strength and frequency of hurricanes decreases). Which of these factors determine? For example, Markowski et al., argue that evidence is that the first factor is crucial (at least in some regions). In the future will be even more important – they claim. They believe that the changes will be (more or less) linear. Currently in high latitudes increases the number and strength of some extreme phenomena, mainly in spring and autumn (but not in summer). It is associated with rapid changes in the temperature (and pressure gradients) during the transition from cold to warm season (summer – winter). In the past, however – as a result of strong warming – was created “Equable Climate”. But we not know enough accurately: why? It is still a great unknown (http://www.seas.harvard.edu/climate/eli/research/equable/climate.html). Certainly the Equable Climate occurred during the last interglacial: Eemian. http://blog.chron.com/climateabyss/2011/12/dispatch-from-agu-an-equable-climate-curveball/). Author of the theory of Equable climate (as a warming effect) – Farrell, claimed that the Hadley cell increases upward and breadth (up to the poles). And so say the IPCC reports. This results in meridian equalization of temperatures. However, changes during Cretaceous were different – not linear (hpothesis: non-linear response of the width of the Hadley circulation)! Hasegawa et al. 2013., Drastic shrinking of the Hadley circulation during the mid-Cretaceous Supergreenhouse (http://www.clim-past.net/8/1323/2012/cp-8-1323-2012.pdf). Most likely, influence (on the frequency and strength of hurricanes and cyclones) SST and water vapor, is compatible with equation e.g. y = t4 (http://www.megamatma.pl/res/upload/RYSUNKI_DOBRE/liceum/plik_4_12/1.gif) and the influence the gradient decrease, is according to the equation y = 3t – at some time warming (e.g. max. Eemian), is dominant. Fortunately, the factors are countervailing, and also fortunately, confounding. First do not fool yerself, then do not fool others. Delusion, duplicity and science make not a good mix. The more we blame man for warming, the more we are dependent upon that blame. The more we thank the Anthro input, the more we corn you cope. The higher the climate sensitivity to AnthroGHGs, the colder we would now be without that effect. The temperature rise since the Little Ice Age has had vast and demonstrable benefits. Whatever man has had to do with that rise, it has been from the coldest depths of the Holocene. Thanks and reward are deserved for the warming, not to mention the fertilizing, effect of AnthroGHGs. This point of view in unappreciated today, but will become increasingly appreciated, even if the high sensitivity estimates unexpectedly turn out true. And we haven’t enough fossiled fuels to maintain a Holocene like climate, not with this miniscule control knob. Currently wintering in Florida. From a sociological perspective the biggest difference I can see between New England and the deep south is in the greater friendliness of the people. Strangers smile and say “good morning” and pretty young female cashiers call me “honey” and “sweetheart.” Back home they take this old guy’s money as if I’ve just sneezed into it, and don’t so much as look me in the eye. People live longer down here, get more exercise, have more fun. Sun and warmth is spiritually replenishing in its effect, and something precious for mankind. Grateful for every warm day. Well, then, demonstrate those demonstrable benefits. Don’t be like Phatboy and say I could if i wanted to, but I don’t want to. If it is left to a UN-type court to determine whether climate change is causing extreme events, it might not matter what actual peer reviewed science says, it might not matter that people like Roger Pielke, Jr. have done yeoman’s work in exploring real trends in tornado, hurricane, drought-type disasters. It wasn’t long ago that a UN commission on crimes against humanity had among its few, rotating member countries places like Quadafi’s Libya and Zimbabwe — I no longer remember the specific countries, but they were of this ilk. The UN is a political body, as is its evil spawn, the IPCC. And don’t leave it to the lawyers, they are concerned not about truth, but about winning. If it’s left to any court at all, probably. Courts are part of the political structure, which overall has a monumental vested in new CAGW-inspired taxes and powers. So why wait for the science to actually settle, when by political/judicial diktat you can simply say it’s settled? And since vested interest is the guiding force, no need to expend energy trying to build and hold together some shaky ‘conspiracy’ (the dimmer and more desperate alarmists like to pretend is necessary). Just have judge rule that CAGW is true, and get taxing. That’s what Huhne has in mind. And it may well happen. These extreme “lawyers” will bring great harm to this world. This “claim” ignores all the fruits and gains of industrialization. The time which could be devoted to science, the knowledge developed and communicated. All of which has benefited these developing nations, and which will be their salvation in the crowded future. The path these “principled” fools embark upon is one of conflict, discord and destruction. Not to mention personal wealth and/or political power for the ‘principled’ fools. But I am sure that all that is secondary (or tertiary or even further down the list) to the benefits that we can expect to accrue over the next 50-100 years from the 0.2C (max) reduction in the TOE that will be achieved by their ‘principled’ destruction of our fossil-fueled civilization. This is why the US needs to keep its distance from the UN. We always need to maintain an position where we can tell them to go pound sand, even if it means breaking treaties. We should never surrender our sovereignty to anyone! I think unity is better than sovereignty because there is strength in numbers. Imagine what it would it be like if the United States of America were 50 sovereign countries instead. Some of theses little countries would be very weak(examples are Rhode Island and Delaware). Now, imagine if we merged with Canada and Mexico to form a United States of North America. We would be a stronger nation than we are now, and this illegal immigration problem would be largely solved. So, jim2, what is better, stronger or weaker? You’ve drank too much of the lefty Kool-aid max. So you would sleep with the likes of Hassan Rouhani, Vladimir Putin, Girme Giorgis, Kim Il-sung, and many other blood-thirsty dictators? Good luck with that. We are better off sticking with NATO than the corrupt and lawless UN. What a strange idea – the only weakness would be military. But then they could cooperate militarily if need be. Everything else could pretty much carry on as before. Plus there would be the added advantage of having their own, different policies various issues, if they wanted to, rather than the “unity” of having Federal law rammed down their throats. The main reason they did not press ahead then was that the scientific case is strengthening by the month. THE SO CALLED SCIENTISTS ARE GETTING LOUDER BECAUSE THEY ARE GETTING MORE DESPERATE. LOOK AT THE ICE SHIP. THEY CLAIM WARMER EVEN WHILE THEY ARE LOCKED IN ICE. A later case will be even stronger. NOT WITHOUT ACTUAL MEASURABLE WARMING AND MEASURABLE SEA LEVEL RISE DEMONSTRATED WITH HONEST DATA. Lowering of CO2 would take away food and would kill people, but they did not worry about killing people when they took away DDT. When it was first introduced in World War II, DDT was very effective in reducing malaria morbidity and mortality. The WHO’s anti-malaria campaign, which consisted mostly of spraying DDT, was initially very successful as well. For example, in Sri Lanka, the program reduced cases from about 3 million per year before spraying to just 18 in 1963 and 29 in 1964. Thereafter the program was halted to save money and malaria rebounded to 600,000 cases in 1968 and the first quarter of 1969. The country resumed DDT vector control but the mosquitoes had acquired resistance in the interim, presumably because of continued agricultural use. The program switched to malathion, which though more expensive, proved effective. Today, DDT remains on the WHO’s list of insecticides recommended for IRS. Since the appointment of Arata Kochi as head of its anti-malaria division, WHO’s policy has shifted from recommending IRS only in areas of seasonal or episodic transmission of malaria, to also advocating it in areas of continuous, intense transmission. The WHO has reaffirmed its commitment to eventually phasing out DDT, aiming “to achieve a 30% cut in the application of DDT world-wide by 2014 and its total phase-out by the early 2020s if not sooner” while simultaneously combating malaria. The WHO plans to implement alternatives to DDT to achieve this goal. South Africa is one country that continues to use DDT under WHO guidelines. In 1996, the country switched to alternative insecticides and malaria incidence increased dramatically. Returning to DDT and introducing new drugs brought malaria back under control. According to DDT advocate Donald Roberts, malaria cases increased in South America after countries in that continent stopped using DDT. Research data shows a significantly strong negative relationship between DDT residual house sprayings and malaria rates. In a research from 1993 to 1995, Ecuador increased its use of DDT and resulted in a 61% reduction in malaria rates, while each of the other countries that gradually decreased its DDT use had large increase in malaria rates. Best to read the whole wiki though as just taking out this section leaves out much of the story. In the 1970s and 1980s, agricultural use was banned in most developed countries, beginning with Hungary in 1968 then in Norway and Sweden in 1970, Germany and the United States in 1972, but not in the United Kingdom until 1984. Vector control use has not been banned, but it has been largely replaced by less persistent alternative insecticides. SpringyBoy may have correctly identified albedo as factor in climate variability. Unfortunately, albedo is not a spontaneous forcing but rather a feedback that occurs as a result of the other factors, such as a warming trend (in which case albedo is a positive feedback). Looks like the stranded antarctic researchers encountered the effects of a negative albedo feedback, if this continues for a hundred years, Africa will be frozen. Just bye the bye: Apart from the sun and the earths seismicity (and possibly jovian planets) everything is a feedback. However feedbacks are replaced by forcings in climate models in order to reduce complexity. The ideal model would have as few independent variables as possible. Current climate models have over 30. Hence these endless arguments over what is a feedback or a forcing are really just about the extent of the over-simplifications of the model being considered. … albedo as factor in climate variability … [this] is … a feedback that occurs as a result of the other factors, such as a warming trend (in which case albedo is a positive feedback). Negative for (reduced) ice cover, but positive for (increased) clouds. …white man’s smoke make gods angry? Are all of the ‘victims’ Leftists? Getting the results of a climate model into court? Jeez that ought to be fun. Plus the issue of cross-examining, under oath, the producers and proponents of the various climate models. We are only talking about 0.6 degrees per century. this is so tiny it can be described even as a random walk. The idea that nature would flatline without mans involvement is an assumption that is contradicted by the large temperature excursions of the past. Neither Skeptics nor believers of manmade climate change know why the medieval warm period or the little ice age happened – but they did. The challenge is to find out what this natural variation consists of prior to establishing any manmade effect on top. The worst part of the climateers assumptions is that fossil fuels cause both warming and cooling. In periods of cooling they assume aerosols dominate but in periods of warmth they assume CO2 dominates. It is mere shamanism at best! 1. describing is not explanation. ‘Liberals are crazy’ is a description. Explaining it means you take one set of things ( their actions for example) and explain it by pointing to another set of things ( their bad upbringing).. for example and argue that one thing causes the other. Describing something as a random walk is not explaining it. 2. temperature cannot be a random walk. Its a physically wrong model. A random walk has no upper or lower limit. Temperature is physically bounded(at least on the cold side). For example, a random walk could go below 0K, temperature could not. We know that temperature is not a random walk, that is the data generating process cannot be a random walk. Mosher is being nitpicky and pedantic. The random walk model of stock pricing has been a standard for half a century even though stock prices are non-negative. (I recommend Malkiel’s classic “A Random Walk Down Wall Street.”) If you want to get all technical it would be a model of a random walk with a reflecting barrier (I hope it’s not absorbing) at zero. There are reasons to doubt that global average annual surface air temperature is a random walk, but you’d need pretty awesome data to rule out a unit root within the upper and lower bounds. Firstly the egregious Huhne – who although he has been released from prison is still AFAIK under license – is the Chairman, Europe of Zilkha Biomass. the US company chopping down old growth US forests to be converted into pellets and shipped to the UK to be burned in Drax power station to permit the UK to fulfill its commitments to the EU “Green” energy directive. Just how chopping down trees in the USA, subjecting them to energy intensive processes such as pelleting and drying and then shipping them half way round the World is supposed to reduce anthropogenic CO2 emissions is not clear. So it appears he has powerful friends on both sides of the Pond. 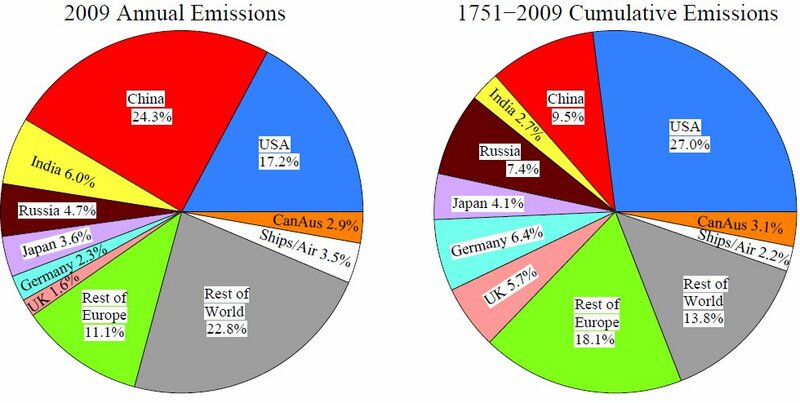 Taking into account all greenhouse gas emissions emitted during the 1850–2010 period, the relative contribution by developing countries to global cumulative emissions was 48%. The group of developed countries was responsible for 52%. By 2020, the share of developing countries will probably amount to 51%. Hence, somewhere during the current decade, the share of the cumulative historical emissions in developing countries will surpass that of the developed countries. So, when the “developing” countries’ contribution exceeds that of the “developed” countries – which is apparently likely in the very near future, can we expect them to pay for catastrophic weather events such as Sandy befalling the “developed” nations? There is nothing new here. Nothing is being threatened that the Eurocommies tried to do to the US by way of Kyoto: bleed America like a stuck pig. George Bush said, “Nyet!” to Kyoto whereas Al Gore would — if elected — said, “Hell Yeah!” What to solve the global warming problem? Elect people to public office that say, “Yes, yes, yes,” not, “No, no, no” to America. The regulations, taxes, and extortionate lawsuits are the reason that CAGW was invented–and I use the term accurately–twenty-odd years ago. CAGW has provided the justification for progressives to assume essentially infinite power over us and to confiscate hundreds of billions of our dollars/dollar equivalents and give it to themselves and their friends over the years. And, if the subject post is any example of their intentions, they have only just begun. The Eurocommies will try anything to prop up dead and dying Old Europe in an attempt to avoid the coming inevitable economic and social collapse. For them the poor of the world are simple pawns the EU’s big, AGW Global Governance, Planning and Control charade. Guess what? Most of the world, living in Brazil, Russia, India and China are having a good chuckle over it. What if it turns out uncertainty is the only thing we can be truly sure about? Should that make us more eager to put our futures into the hands of unelected bureaucrats? I prefer being uncertain about uncertainty. If I were certain about uncertainty, I probably would spend most of my time behind locked doors in bed with the covers pulled over my head. Or land or life, if freedom fail? ordvic, I’m certain enough to act. If I weren’t certain enough to act, I would never do anything. Dwelling on uncertainty, obsessing over it, can be paralyzing, and failure to act is not free of consequences. Maxy – to be a citizen scientist you actually have to do some science. Uncertainty is a sop to the virtual, if misguided and profoundly unscientific certainly of the Borg collective cult of CAGW groupthink space cadets. Wonder if this prompt them to review their assumptions? As if. Actually – science is virtually certain (>99%) that the greenhouse gas residual warming is at most 0.08 degrees C/decade. The really funny thing is that this would not be a problem at all – probably offset by cooling in Bond Event Zero – if it were not for deterministic chaos. The chance that we are not in a cool Pacific decadal mode – and that these don’t last for 20 to 40 years in the long proxy records – is vanishingly small. The likelihood of predicting climate beyond that – any time soon – by any means more accurate than tossing a coin is likewise vanishingly small. Scientific reality rather than uncertainty. We put the Dept. of Motor Vehicles in the hands of unelected bureaucrats. How’s that working out for you? @Pete Bonk – at least in this state, they charge LESS to use the computer (internet) than by snail mail or in person. Just a buck, but at least it is something! No, all you need is a pulse. But as I’m sure you know, being a prolific citizen scientist requires a strong urge to talk about subjects you know little or nothing about. Well – you actually need a functioning brain as well Maxy. And merely blathering about what you think people don’t know is not new, interesting or informative. I have been challenging people to actually read science rather than indulge in the usual science free talking points. An especial challenge for you I presume because all you do is science free blah blah blah. Web, Chief Hydrologists is an armchair scientist. He reads about science, dreams about science, and talks about science, but doesn’t do research. Mostly, he just talks. W&H is work and heat. It is a relatively precise first order planetary energy equation derived from first principles. webby seems to have difficulty with simple dimensional analysis – and equivalency. Watts for 1 second is Joules – and is the unit energy. So what we are talking about is the average unit energy over a period. We can simplify as long as the terms are defined. Where energy in and energy out are the average unit energies over the relevant period. It makes much more sense to talk about energy in and energy out – and the differential implies that this has a time dimension – i.e J/Δt. But I have changed it to power in and power out – which is Watts.s/Δt = Joules/Δt and is strictly incorrect as we are talking energy and not power – because people clearly can’t cope with power and energy equivalancies in a first order differential. Webby is clearly a confused little punter. Is this perhaps more explicit? Although I think the Δt is implicit enough. Not for webby it seems. It is a framework for thinking about global energy dynamics. Because it is a differential form – we are looking at changes over a period rather than absolutes. Lucky because changes is basically all we have that is at all reliable. The left hand side is mostly ocean heat. Positive change in the ARGO period. Energy in is the sun. But also of course with shorter periodicities – the current peak of which is why we are not yet cooler – but we will be. Energy out is reflected SW and emitted IR. By all means think about it. I am a trained engineer – specialising in hydrology as the handle would imply – and environmental scientist. Although the handle derives from Cecil Terwilliger – Springfields Chief Hydrological and Hydraulical ofiicer – I am still a hydrologist. Which in my neck of the woods involved intense study of ENSO and wider Pacific variability over decades. I routinely run complex computer models. I am an expert in hydrology, hydraulics, water quality and biogeochemical cycling – as well as in the multi-disciplinary science of the environment more generally. I do science on a daily basis. I publish on environmental science and climate science commentary more generally – not prolifically but ahead of the curve. Do these twin twits expect science to be done in the blogosphere? I am a real scientist – and vastly more educated in relevant areas than Cheech and Chong here. Do they expect this level of juvenile snark to be of any interest or relevance to anyone? WHEREFORE We direct that the United Nations’ Intergovernmental Panel on Climate Change, for its Corruption, its Extravagance, and its Mendacity, be utterly disbanded forthwith and for aye. The Treaty of Copenhagen shall not pass. No Climate Bill shall pass. We will remain free. Sorry, Waggy, those who signed that petition were not THE people of the USA, they were SOME people of the USA, some people America would be better off without. Not so — whoever those people may be you can be sure they all believe that no one should be denied the freedom to choose their attitude. Waggy, those petition signers have the freedom to lie by saying they are THE people of the USA, and I have the freedom to point out they are liars. The truth is they are only Some of the people of the USA. Furthermore, I have the freedom to say I believe America would be a better place without them. Separate the church from the state… Hope or Hop? You have the freedom to break the law once, Maxie. Or at least try to break it. You might not have the freedom to try breaking it twice. At least try to appear competent! Oh, I knew N. Korea and Iran were UN members. I was just fooling with jim2. So why didn’t they lie in the first place and claim CO2 is 3x as strong? Deniers do not understand that science is self-correcting. I don’t know, maybe they just couldn’t think beyond their own self-confidence. Whatever, that’s a pretty serious accusation you’re making about them there. does this mean michael finds 3x warming alarming? I’m not losing much sleep about the matter. Because it would have been an implausible lie. The effect from just CO2 is from first principles……..and you know that WHT. Truebelievers don’t understand that climate science isn’t real science. It’s political science, because that’s who pays for it. No conspiracy at work, or needed, just blatantly obvious vested interest. Whut, the deniers (A-warmists) indeed do not understand that science is self-correcting and does not care about paradigms. Skeptics and contrarians are the correcting mechanism of science. I am using all the skeptical arguments. I am using Stadium Waves from Curry, orbital factors from Scafetta, orbital factors from Ian Wilson, the ENSO SOI contribution suggested by Bob Carter, the tidal factor looked at by Clive Best, and the sunspot data suggested by countless skeptics. After I put all that in, you still don’t like it because the result does not agree with your political agenda. Whut, I don’t like it because of the CO2 control knob. I’m not convinced of any significant CO2 effect. What’s your prediction for the next few decades? I predict a flat 30-year trend by 2020 and even more cooling after that. What if compare to historical data observe less distasters than before “climate change” are observed ? Poor countries will give money to rich ones? erm. What global warming? Given that temperatures have been declining for over a decade, on what will they base the charges of “warming”? So these idiots think you can actually point to a particular rainstorm or tornado or hurricane and say “Ya see?! Ya see?! It’s because you drove your car!”. Don’t they realize individual catastrophic events involving tornadoes, hurricanes, etc. have occurred since the beginning of recorded history? You can’t draw one to one mappings like this. Science and the rule of law are great concepts. On the other hand, we have pal-review and inept legal systems. “legal reckoning” (not the same as justice) — don’t go there if you can help it. empires were doomed they had many laws. I’ll predict (or is that project) the advocates of human induced extreme weather are going to discover that in a court room factual evidence is usually required. I foresee this being a problem for them. If I remember correctly, 132 developing nations recently demanded at a Warsaw climate summit a compensation, and walked out when they were not promised anything. ” … asking the International Court of Justice for an advisory opinion on the responsibility of historic emitters for global warming” is a double effect thing, because court of justice could: either condemn emitters, either pardon the emitters. And if emitters are absolved anthropogenic global warming could the be a dead theory. The governments of the developed countries should send the bill to the technologically emerging countries for the transfer of knowledge that they got for free from us; knowledge that came at a great cost to our forefathers who developed and applied their scientific discoveries for the benefit of all mankind. Now those countries who got all that knowledge for free are sending us the bill for allegedly creating a problem to them, a problem that may not even exist at all. It’s about time we ask them to pay up. Huhne is in the bargaining stage. Too bad the models dealt him such poor cards. We identified the enemy by looking in a mirror ! p.s. note right wing rag to entice some maxyisms! So true, Americans work very hard to pay taxes for the defense of Western civilization so that the Eurocommies can seek climate change on their 6-week vacations. Chris Huhne was sent to jail. His words carry no weight here. Let’s move on. Maybe he’s guilty of perverting course of justice but Al Gore is guilty of perverting science and turning English into a liars language. We could be 3 days into the next ice age. If so, I hope everyone enjoyed global warming while it lasted. Happy New Year! Reckoning? Sounds like a threat to me. Like a declaration of war. Think of it as the unborn paying the bill for the insanity of today’s Leftists. Just to experience the feeling of belief the shamans of global warming alarmism must feel, can any of them share with us what we outsiders must do to prepare ourselves to receive the news about the One — that mystical element we all call CO2 — so that we too are able to visualize the magical world of AGW theory? Obviously, science nor any formal education nor even any common sense is of any help in recognizing and coming to an appreciation of that special vision that Al Gore and all of the rest of the global warming alarmists share. the study of past climate changes confirm CO2′s effect and gives a fairly good estimate of the feedbacks. Are you referring to the hockey stick fraud here? Or longer ago, when CO2 lagged temperature by 800 years? “Novel Analysis Confirms Climate “Hockey Stick” Graph,” Scientific American, November 2009, pp 21-22. No, they all used the same technique. And all suffered the same fate. They did not reflect modern instrumental records. They relied on small (sometimes just a single) ring samples. And they did not reflect known facts from past temperature proxies. In short, they were revisions of a failure. not new work. Bah, the shaft, you fraud. And all using the same flawed data, as McIntyre points out. There is a good reason even the IPCC dropped it. PS: The IPCC did not drop the hockey stick. See the IPCC 5AR WG1 Ch5 section 5.3.5.2 and 5.3.5.3 . It also used thousands of non-peer reviewed NGO crap in their last report. Contrary to their own guidelines. The IPCC is not a science organization, nor does it produce anything worthy of a scientific discussion. Perhaps you need to read their mission statement. And learn about Hockey sticks and debunking. I got as far as ‘Chris Huhne’. Checked it was the same convicted conspiracist and perjurer that once was a minister in UK. Facts are the foundation of all litigation, so the sooner that climate scientist’s attribution research is exposed to forensic examination the better. And as the late Michael Crichton tried to explain to a Congressional Committee some years ago, predictions are not facts. Evidently Huhne’s recent court appearances have not taught him to be very careful what he wishes for. In a civilised society the judicial process is not concerned with political correctness, political reputations, or the interests of politicians: just the facts. Facts are the foundation of all litigation, so the sooner that climate scientist’s attribution research is exposed to forensic examination the better. Since the government (parliamentary) ‘investigation’ into the goings-on at a government university over the Climategate revelations was a completly biased farce by one part of the state protecting another, calculated to exonerate it no matter what, we can probably expect the same again from any judicial examination of government climate science. This is no doubt what Huhne means. Unfortunately, facts can be misrepresented in courts, as can be attested by many serving time behind bars. One case which springs to mind is one which happened several years ago in London. A pedestrian stepped out into the road right in front of an oncoming car and was killed. There was nothing the driver could have done to prevent the collision, and his driving could not be faulted. Nonetheless, he was convicted and sent to jail. The reason: he was found to be driving without a valid licence, and the prosecution successfully argued that, had he been complying with the law, he would not have been driving and therefore the accident would not have happened. The one big flaw in this reasoning, but which unfortunately was not picked up by the defence, is that, had his car not been occupying that particular piece of road at the time of the accident, another car probably would have been. None of the Climategate enquiries were even quasi-judicial processes. That was their great failing. The facts in the case you mention seem clear enough. It is the court’s decision that appears arcane. It’s a system based on a fixed set of rules, and rules will always have unintended effects in unforeseen situations. Some court decisions are insane according to common sense but correct according to the rules. And some are arbitrary because the rules are ambiguous. And I don’t believe there is a way to build a system that avoids that avoids both those problems. That court decision was due to a misrepresentation of the facts. That last comment should have been signed TonyN, and not with the name of my blog. So, harmlesssky, what’s the name of your blog then? That’s false. CO2′s absorption spectrum didn’t change in 1850 — it’s been the same since the Big Bang. This is similar to comments I had from a commenter to an essay I posted at WUWT in which I stated that “No statistical trend, no matter how precisely calculated, regardless of its apparent precision or length, has any effect whatever on future values of a data set “. The commenter insisted (repeatedly…) that trends did effect future values whenever the trend continued….and only failed to effect future values when the trend changed. The “scientific case” for Developed World ‘blame’ for the adverse effects of climate change will strengthen by the month ONLY IF the climate change community can continue to make it appear that the climate is changing adversely and that is doing so in response to CO2 emitted in the process of worldwide industrialization. So far this century, this is not looking good for those with this agenda. World temperatures are showing no signs of returning to the rapid rises of the 80’s and 90’s. There appears to be less and less, not more and more, evidence that atmospheric CO2 concentrations are the main control knob for the planetary climate. This is complete stupidity that invites non-western countries to demand ransom for a non-existent anthropogenic warming. At the Warsaw conference Bangladesh already started it and is demanding 100 billion dollars for being victimized by global warming. When I say non-existent I say that as a scientist who knows what to do with scientific observations. Start with the lack of warming now. There is more carbon dioxide in the air than ever before but there has been no warming since the beginning of the century. This absence of warming is recorded in official temperature curves and cannot be doubted. The IPCC theory of greenhouse warming is based on the work of Arrhenius according to whom carbon dioxide absorbs infrared radiation passing through the atmosphere, gets warm, and thereby causes greenhouse warming. Despite the abundance of atmospheric carbon dioxide this simply is not happening. Hence the greenhouse theory as used by IPCC is false and must be discarded. The scientifically correct greenhouse theory comes from the Hungarian scientist Ferenc Miskolczi. Unlike the the Arrhenius theory based on observations of a single gas – carbon dioxide – his theory accounts for a situation where several greenhouse gases simultaneously absorb in the IR. In such a case an optimum absorption window exists that is measured by the optical thickness of the atmosphere in the infrared. The gases present jointly maintain this optical thickness if conditions change. Now it happens that for earth atmosphere the greenhouse gases that count are carbon dioxide and water vapor. Their joint IR optical thickness is 1.87. It corresponds to15 percent transmittance or 85 percent absorbance in the infrared. If we now add more carbon dioxide to the atmosphere, it will start to absorb, just as the Arrhenius theory says, and optical thickness will increase. But as soon as this happens, water vapor starts to diminish, rains out, and the optimum optical thickness is again restored. Hence, the addition of carbon dioxide will not be able to raise atmospheric temperature because the effect of added carbon dioxide is neutralized by this action of water vapor. And this is what explains the lack of warming now. The latest count of these recalcitrant non-warming years right now is 17. But this is not all. There was a similar non-warming period in the eighties and nineties that lasted for 18 years. Put these two together and the total number of no-warming years becomes 35. That is actually longer than the time that IPCC has existed. If those other 18 years puzzle you it is because they were cleverly hidden by a fake warming in official temperature curves. It was then called “late twentieth century warming.” No one had any idea what caused it and that was taken as proof that global warming is man-made. Man-made all right, in the back rooms of the guardians of global temperature. When I wrote “What Warming?” I realized that this warming was fake and even put a warning about it into the preface. Nothing happened for two years and then I discovered that the big three of temperature – GISTEMP, HadCRUT, and NCDC – all had decided not to show this warming any more. What they did was to line up their temperatures for this period with satellites that never showed the fake warming at all. This was done secretly and no explanation was offered. And it also required trans-Atlantic coordination to work right. Conspiracy anyone? The discussion is missing the basics. By far the main reason for increased cost of natural disaster is the increase in life expectancy and hence population and increase in wealth and property everywhere on the planet. This is a consequence of the industrial revolution and an achievement only possible through hardest work and ingenuity in the first world in the past and probably would have been impossible without use of fossil fuels. A second point is that without the CO2 fertilization effect, the blooming of the biosphere and a recovery from the little ice age (for whatever reason), current world food production would seem unlikely to be possible. A third point is that the massive new populations and their consumption elsewhere, plus the huge populations immigrated into the first world, have probably already surpassed the CO2 emissions of the early pioneers of present day global welfare. So the corporations and governments that paid green mail are going to discover what is known to anyone who has paid extortion money to thugs. The thugs want more.